Our Practice - Donald B. Rhodes, O.D. Dr. Rhodes began practicing optometry after attending the University of California for his undergrad and optometric education. He grew up in Anderson where his parents taught school. In high school he was student body president and league MVP in basketball. He still holds the high scoring record of 49 points in a single game for Anderson High School. Sports and youth have been a significant part of his life. He has been on the Palo Cedro youth baseball and soccer boards and has coached many youth sports. He is a member of the American Optometric Association, California Optometric Association, a past president of the Golden Empire Optometric Association, and has been a board member of Prevent Blindness of Northern California. He was also the president of the Redding Breakfast Lions Club. He and his wife Lorna have 6 children: David, Daniel, Mary, Sarah, Mark, and Elizabeth. They also have 6 Grandchildren: Juniper, Ramona, Arlo. Desmond, Josephine and Graham. Doctor and his wife have lived in Palo Cedro for over 45 years where they have had the following animals: horses, cows, pigs, sheep, goats, chickens, pheasants, peacocks, cats, dogs, fish, snakes,lizards, a chameleon, an iguana, rats, guinea pigs, a scorpian,a turtle, hamsters and rabbits. 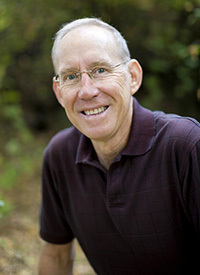 Dr. Rhodes enjoys spending time with family, golfing and working in his garden. Work Experience: Stephanie began working in our office in July 2014. She has worked in an office environment for the past 12 years and enjoys working with the public. Personal: Stephanie moved from Modoc County and loves spending time with family, camping and relaxing at the lake. Optometric field for 10 years. Personal: Brandy enjoys running, bike riding and spending time with family. Work Experience: Kathy Emma is new to optical but has hit the ground running. She is an asset to our office and will greet you with a smile as she takes you back for pre-screening. Personal: Kathy loves to bake, she and her husband are foodies! She loves dogs, Zumba and reading. Work Experience: Amber has been in the optical field for years and has just recently joined our office. Personal: Amber enjoys watching her 3 kids play soccer, 4-H, football, golf, basketball and track and field. In her spare time she enjoys refinishing furniture and spending time with family. Work Experience: Kelly has been an optician for over 20 years. ​Personal: Kelly enjoys traveling with her family and watching her 2 kids in all their different sports activities.